Larry D. Kreighbaum age 71 of Kokomo formerly of Knox area, passed away on Thursday February 7, 2019 in the Community Howard Regional Health Hospital in Kokomo. Larry was born in March 17, 1947 in Argos, Indiana to Jacob Raymond and Katheryn Elizabeth (Rains) Kreighbaum. Larry was a resident of Argos, Knox, Plymouth and Kokomo areas. He was a graduate of Plymouth High School. Larry retired from and enjoyed many years in sales. He loved spending time with animals and was a dog handler and trainer for the Department of Corrections. He was a member of the Wolf Park in Delphi, Hickory Grove church in Delphi. 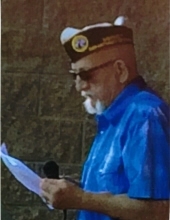 Larry was also a member of theVFW Post #1162 and a Life member of the DAV Post #42 of Plymouth. Larry also served as the District Commander of Indiana DAV in 2014 & 2015. Larry honorably served his country in the United States Army during Vietnam. The Van Gilder Funeral Home is honored to be entrusted with the arrangements for the Kreighbaum family. A memorial service will be held in the Van Gilder Funeral Home, 300 West Madison Street Plymouth, Indiana 46563 on Sunday, March 17, 2019 at 2:00 p.m. EST with visitation from 1:00 p.m. to 2:00 p.m. Flag presentation will be provided by the Army Honor Guard. Burial will take place in the Stoney Point Cemetery, Atwood, Indiana. Memorial contributions may be made to the Plymouth DAV Post #42 or Wolf Park 4004 E. 800 N. Battle Ground, Indiana 47920. To send flowers or a remembrance gift to the family of LARRY DEVON KREIGHBAUM, please visit our Tribute Store. "Email Address" would like to share the life celebration of LARRY DEVON KREIGHBAUM. Click on the "link" to go to share a favorite memory or leave a condolence message for the family.